The Boston Dynamics created the PETMAN robot, which in a suit of chemical protection is almost indistinguishable from the live person. Initially PETMAN intended for tests of soldier’s equipment, and natural tests which can entail death of people, for example testing of suits of chemical protection with use o f real poison gases.For this reason PETMAN has an anthropomorphous design, which is most repeating outlines and kinematics of a human body. PETMAN imitates movements of the person rather precisely. It is especially necessary for check of suits of chemical protection, after all in fighting conditions at use of the chemical weapon even such trifle as the crack in incorrectly cut out fabric can lead to death of thousands soldiers. PETMAN is equipped with a set of sensors, which allow to estimate, and safe this or that equipment will be how convenient. PETMAN is interesting also to that on its base the field option is created: the Atlas robot soldier, which participates in the DARPA Robotics Challenge program. Atlas is very similar to PETMAN, it has 28 degrees of freedom, powerful hands and feet with the hydraulic drive. It will be even more mobile, than PETMAN. At the moment PETMAN robot is able to go a fast pace, both on equal, and on a cross-country terrain, including ladders, holes and low barriers. The Atlas robot is positioned as the rescuer, who will be able to use the same equipment, as people, but thus will be able to work in literal sense in inhuman conditions of a fire and radiation infection. The technical characteristics allow to use the robot as the fighter. 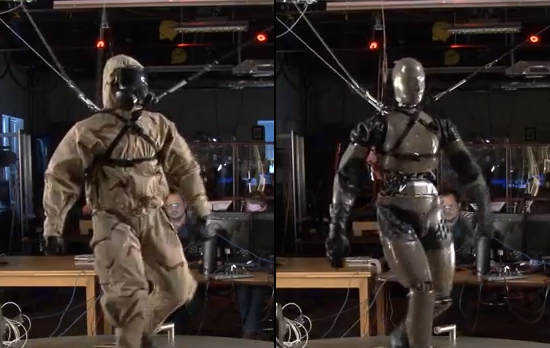 Hands of PETMAN and Atlas can hold the conventional weapons intended for people, and the robot can carry standard regimentals, including helmets and bullet-proof vests.